The Thin Negative Line – Do academics dream of electric sheep? 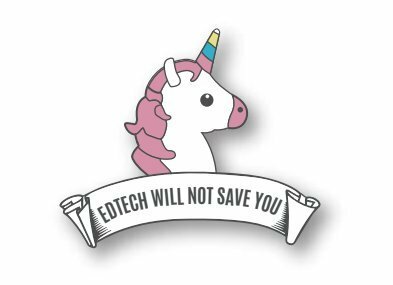 If you went to this years ALT conference, you may have noticed the “EdTech will not save you” badges worn by delegates. Unsurprisingly, given the audience of ALT, they were met with some criticism (ironic). This post relates to the thin line we tread between critique and negativity. ‘tech wont save us’ brings unwarranted negative connotation. Be critical, not extreme. I won’t say who said this but I bet you can guess what industry they work in. I’ve written about this rather tedious attitude in The Criticism of Criticism blog post. This reductive idea that criticism, if you don’t agree with it, is negativity and should, therefore, be dismissed. Technology it seems, is beyond reproach. If you can’t say anything nice, don’t say anything at all. I think describing the badges as extreme is ridiculous because it’s actually true. EdTech will not save us. This is purely my interpretation, you would have to ask Lawrie Phipps and Donna Lanclos to explain the ideas behind the badges for accuracy, but it relates to the positioning of edtech. Edtech has for many years, been positioned (by us and vendors alike) as a solution to teaching and learning ‘problems’. As a quick and easy means of improvement. Teaching and learning is not a problem to be solved and THAT IS THE POINT OF THE BADGE. Vendors of EdTech products like to posit their wares as solutions to problems you didn’t even know you had. They like to appropriate pedagogical language and, to some extent, have been surreptitiously driving the development of digital pedagogy. For some reason, we’re not worried about that. Similar to handing over our data to a faceless company for the affordances of their technology we continue to feed this industry despite the damage we may do ourselves and our discipline. They like to speak to senior management, the people with the £, and espouse how their tool will revolutionise the institution. They peddle their snake oil with outlandish promises that their technology will save us. It won’t, and THAT IS THE POINT OF THE BADGE. Very much linked to the above, some senior management see technology as a solution to problems (even without the influence of vendors) that are long, hard and messy to improve. Instead of investing the organisational development, instead of fighting those long and hard battles and rather than tackle a culture, technology can be seen as a quick fix. Problems with assessment? Slap a bit of tech on it. Problems with student retention? Slap a bit of tech on it. All this does is mask a problem. All it is is a placebo. It makes people feel better whilst nothing is actually happening to the route cause. Of course this is a generalisation and technology can bring genuine improvements, but that’s not always where or how it’s used. We walk around ALT C patting ourselves on the back and reveling in our ‘achievements’. Only a few ask the really important questions about whether what we are doing is good or right or ethical. A placebo may make us feel better but it’s not solving anything, and THAT IS THE POINT OF THE BADGE. There are lots of negatives around technology. if yo can’t acknowledge them, then you’re fooling yourself. Negativity is warranted, and THAT IS THE POINT OF THE BADGE. I will wear mine with pride. I don’t think Kerry’s critique is “harsh” at all, but it is in fact critique, and I am weary of all the times that people (especially, I have to say, women) are told they are being “harsh” when they point out the problems with the way things are framed, or the disconnect between what is needed and what is being offered (yes, by vendors) to the sector. Kerry’s critique is in fact providing nuance, in a context where too often tech is cheerleaded and lauded as The Thing We Need to Do, in place (alas) of paying attention to people. Harsh words on vendors, Kerry. Are we vendors all the same? Having worked in HE and as a ‘vendor’ for many years, I understand your concerns over edtech being presented as a panacea to reduce/eliminate educational problems. However, the interpretation is far more nuanced than you express. In some cases edtech does solve a defined problem, sometimes it may solve other previously undefined or unknown problems, and yes, there are times that it fails, either through poor definition of the problem, poor implementation or badly sourced technology. So the badge is to remind us to apply edtech appropriately? Well, perhaps these events should permit us to scrutinise why tech fails and how we can address the problems. We also need to explore better ways for the education sector and vendors to work better together; through better definition of needs and clearer communication channels, technologies can be provided to be more relevant for evolving educational practices. Are vendors all the same? Ultimately, yes. You’re goal is to sell. The difference is how each vendor sells and therein lies the difference. Some are certainly more genuine and ethical in their sales techniques than others. That can even differ down to the individual sales people you speak to at each vendor. I totally agree, we should talk more about failure at these events. We should be more critical but sometimes that doesn’t ‘fit’ the event. Especially when vendors are the ones sponsoring the events. As I’ve experienced when I am critical, here’s a perfect example ironically, you are told you’re being negative or harsh. I prefer blunt. My bluntness, particularly in this blog, comes from the frustration of the “don’t be nasty” attitude prevalent around edTech. The “no, no be nice, be positive and you shouldn’t say anything if you can’t say anything nice” attitude is tiresome and reductive. Frankly, I’m tired of feeling I have to be nice and balanced about everything (hence the post in the first place). If that approach was working, I wouldn’t have written the post. Nor would the badge exist. Pingback: We need to talk about Jisc – Do academics dream of electric sheep?